Welcome to Calvary Chapel Burney Falls! We are here to share the love of God with all who come by. We meet Sunday mornings at 10:30 AM in the Intermountain Community Center located at 37477 Main Street in Burney. We have combined worship for all ages and have Sunday School for grades K-6 and 7-12. We also have child care on an as needed basis. If you have any questions please call us at (530) 335-2910. We are podcasting our teachings. To subscribe to the podcast and get CCBurneyFalls.org teachings delivered to you so you can listen to it and put it on a cd or on a iPhone, iPad, or iPod click on the orange button above the contact link on the right of the web page. 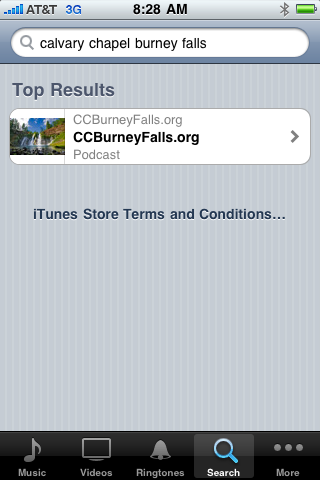 Here is a picture of CCBurneyFalls.org podcast on iPhone and iPod Touch.